My great-grandmother came to America from Denmark, and growing up, some of my very favorite treats were her recipes. I still have a weakness for Scandinavian desserts. This collection of modern takes on traditional desserts is definitely for people who are more than casual cooks. It's well written with US style volume measurements with metric measurements offered in parenthesis, however there is a basic assumption you'll have a strong grounding in basic cooking skills. They are recipes, not step by step instructions. That said, if you do have the grounding to follow the recipes, these recipes will impress. They are different, with amazing textures, appearance and flavors. The carrot cake for example is two moist layers with big, cloud like layers of a cream cheese and fruit whipped cream. The title is deceptive in the best way possible. This is not just cakes and cookies, there are puddings, jellies, and candies as well. 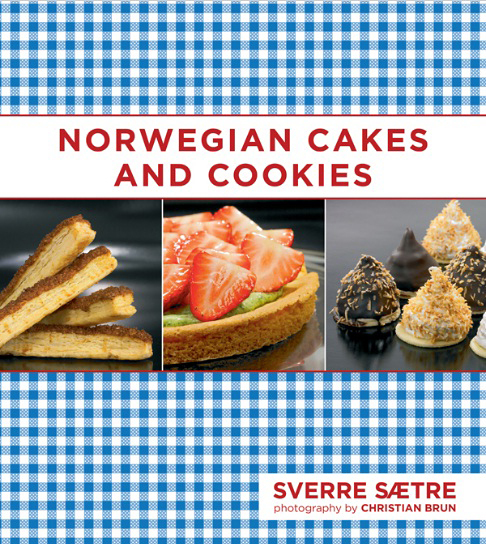 It's Norwegian desserts. Vanilla Butter Cream is hands down my new favorite, go to butter cream recipe. It starts with a cooked pudding like cream then adds butter to make a frosting that's just amazing. Not too sweet and so good. Ginger cookies- easy and wonderful. I love molasses and ginger cookies. Caramel pudding with cloud berries- this is a little fussy, but if you're a fan of custards and caramel, this pudding with any kind of berries is one of the best ever. Poor Knights with Dense Milk and Strawberries- this variation on sweet egg battered stale bread and cream is made with a sour cream- the author suggests kefir which is how I made it. It was a hit with everyone in my family and it's super easy. There are some regionally specific ingredients like butters made with sour cream. A good substitute if you make your own butter is to use creme fraiche (cultured cream) to make butter, then use that in the recipes. Mix 2 Tablespoons of cultured buttermilk with two cups of heavy cream. Put in a jar with a lid and let it set for 4-8 hours. Then make butter using your favorite technique. For berries and fruit, use what is in season in your area. Cloudberries are from the same family as raspberries. They are tart, but in a lot of these recipes, raspberries could be used as a substitute. If you live in a colder region like I do, you maybe able to find cloudberries in the summer. It's gorgeously photographed by Christian Brun and written by Chef Sverre Sætre. Hardcover with full color photographs, published by Skyhorse Publishing.